Book Your Next Trip With Ground Travel Specialist! At Ground Travel Specialist, we are dedicated to providing our customers with the safest, most comfortable charter bus trips possible. We have the nicest, cleanest, most amenity-packed vehicles and the safest drivers to ensure that your trip goes off without a hitch. Call us now to schedule your upcoming trip! 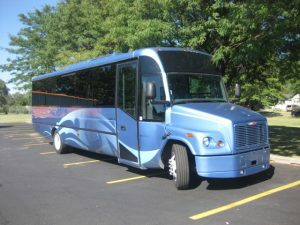 Ground Travel Specialist (GTS) is the premier provider of charter buses in Detroit and across all of Michigan. When you need to get a lot of people somewhere in Michigan or out of the state, we’re here to help. With our fleet of new, comfortable, clean vehicles and our staff of highly trained, safe, and polite drivers, we want to be your go-to charter bus company. Whether you need buses large enough to take your entire congregation or sports team to an event far away or you need a minibus with enough space for a smaller group, GTS has you covered. All of our vehicles are comfortable and clean, and they feature all of the creature comforts your group should expect, including video monitors, a PA system, electrical outlets so everyone can charge their devices, free Wi-Fi, great air conditioning, and so much more. Best of all, thanks to armrests and reclining options, our seats are extra comfortable. If you like to sleep through the trip or you love being awake to watch movies, chat with friends and coworkers, or gaze out the windows, we make it easy for you to travel the way that makes you feel comfortable and relaxed. In addition to our spectacular buses, we only hire and train drivers who are friendly, safe, and experienced. The satisfaction and safety of our customers is always our number one priority and this begins with our drivers. Not only are they experienced in driving long distances in these vehicles, they’re trained to handle all kinds of weather and road conditions, while also providing polite and cheerful customer support to everyone on the bus. This is your trip and you should never feel like your driver is unapproachable. We can’t guarantee that nothing will ever go wrong with one of our charter buses, but we do everything we can to prevent any downtime while you’re on the road. We have our own shop with our own mechanics who thoroughly inspect and tune up every vehicle before it leaves for a trip. They keep detailed logs of the work they perform so that they know when maintenance was done and what is coming up. It’s another way that we try to remove as many possibilities for problems as we can. Contact GTS today to get a personalized quote for your group. If you’re travelling across the country, ask us about our vehicle wraps — they’re a great way to advertise your group while you’re out on the open road!